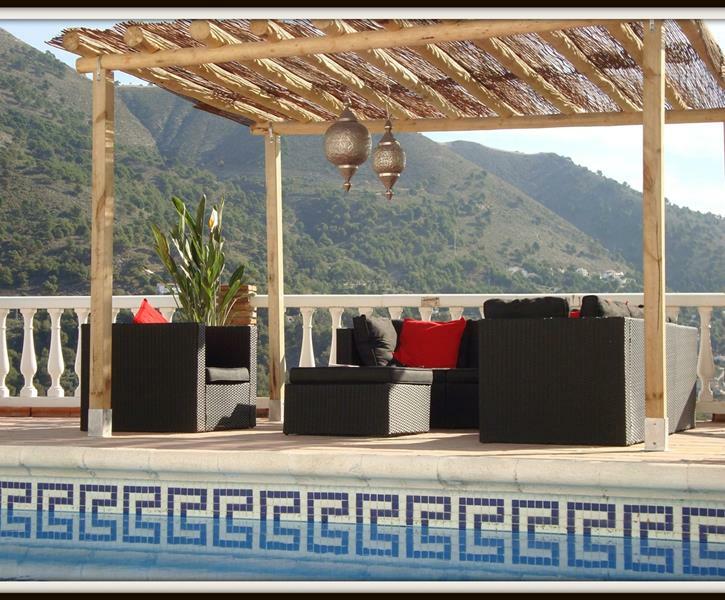 Enjoy Villa La Cordillera which is located just 4 minutes drive (2 km) from the lovely white washed Moorish village of Competa. Specifications: Fenced plot 3536 m², house surface 155m², garden with mature planting and pathways, 3 double bedrooms, 2 bathrooms of which one ensuite, fully fitted kitchen, dining room, sitting area, morning terrace, 8x4 m pool with underwater light, poolhouse with BBQ and bar, patio , terra cotta tiled terrace around pool, parking space and driveway. NO SMOKING, no pets allowed. Pool area & terrace : sunbeds, outside dining table and chairs, lounge set ,patio for shade, BBQ and pool bar. Inside : 2 sofa’s , antique Indian dining table & 6 chairs, SAT TV, HiFi installation with connection cable for smartphone, I Phone, MP3 player etc ( via headphone plug),Wifi , central heating, wood burner, iron, cooking literature, travel literature, Guest’s guide with practical and touristic information. Kitchen : 4 pit gas hob,fridge freezer combination, modern electric multifunctional oven, microwave, dishwasher, coffeemachine,expresso machine, water boiler, table ware, kitchen towels Bedrooms : double bed, large fitted wardrobes, airconditioning/ heating, integrated blinds and fly screens, bed linen and spread, baby bed (1x), high seat Bathrooms : shower, toilet , bidet and hand basin /lavabo, central heating, washing machine(1x), hair dryer (1x) , towels. The property is first class. Well proportioned, clean, well furnished and well maintained. The pool and barbecue area were clean and very clearly well looked after. Management team of Carl and Jenny met us are our agreed arrival time were very helpful on arrival. We had a very early departure on our final day and they supported us with that by coming over the night before departure to check out the villa and settle the return of our deposit. During the booking communication with owner Willy was excellent. I was kept informed, questions were answered fully and promptly and the whole process was hassle free. The location of the villa is beautiful. We had an 18 month old child with us who was travelling for first time. The facilities we needed for her were all there and helped very much for the holiday to go well. The best recommendation I can give is....I will be back. We spent two weeks of peace and tranquility in this beautiful spot. Came home fully relaxed from a great holiday. Lovely villa in a stunning location. Nice to have a super pool, with a choice of areas in which to relax and soak in those views. We did have a few issues with internet connectivity & we understand the owner is working on this for the future.